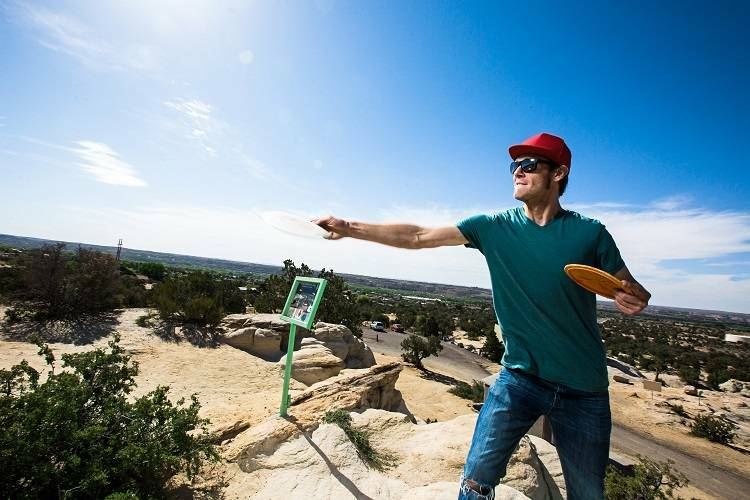 Lions Wilderness Disc Golf Course is located inside Farmington's Lions Wilderness Park. The 27 hole course is more than a mile long. The front 9 is short with slight elevation change and terrain varying from sandy to slick-rock. The middle 9 is longer and more difficult with rolling elevation and denser trees. The back 9 is even longer and the most challenging of the course. Foliage on the course is a mix of juniper and pinon providing a beautifully landscaped course with foliage obstacles that remain the same year-round. 16 holes are under 300 feet, 7 at 300 to 400 feet and 4 over 400 feet. Entrance for the course is free, and the hours are from dawn to dusk year-round. With Farmington's mild climate the course is used year-round. If needed, discs are availabel for rent at the San Juan College Equipment Rental Center. Lions Wilderness Disc Golf Course is located north west of the intersection of Main Street and Pinon Hills Boulevard. From Pinon Hills Boulevard turn north on College Boulevard, then right on Sandalwood Drive. From the park entrance sign, simply follow the road down to the course.